Hundreds of people paid their respects Wednesday for Milwaukee Police officer Matthew Rittner, who was killed in the line of duty last week. The 2,300-seat Oak Creek Assembly of God church was filled with community members and fellow officers showing their support for the Rittner family. During the service, Milwaukee Police Lt. Derrick Harris noted that Wednesday also marked what would have been Rittner's 36th birthday. "Today, on Matt’s birthday, we sit here with heavy hearts and try to make sense of this," Harris said. "But it’s not right. I’ve shed so many tears. Every time I look at his picture, or remember the picture of him holding his son upside down, I get choked up." 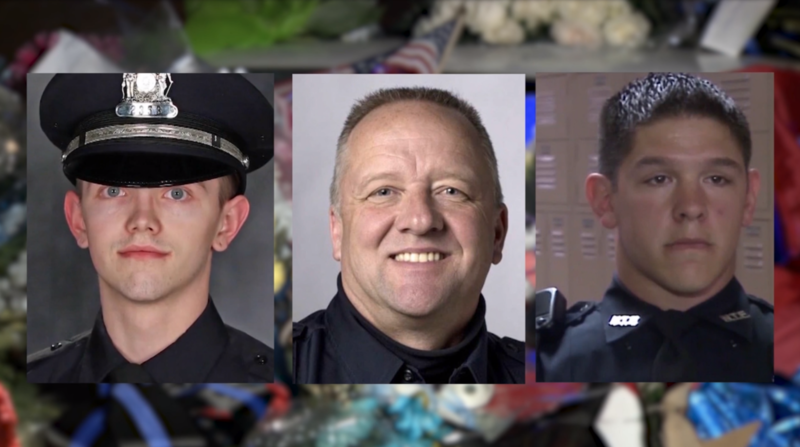 Police honors were performed after the 1 p.m. service, and a procession followed from Oak Creek to Krause Funeral Home in Brookfield, passing the Specialized Patrol Division. Rittner, who leaves behind a wife and young son, was fatally shot a week ago on Milwaukee’s south side while serving a search warrant to a man suspected of illegally selling firearms and drugs. This was the third time in eight months the Milwaukee Police Department has had to bury one of its own officers. Officer Michael Michalski, 52, was shot and killed in July while responding to a call related to a suspect wanted on gun and drug charges. Jonathan Copeland Jr., 30, pleaded not guilty in August to the killing. Officer Charles Irvine Jr., 23, died in June while he and another officer were pursuing a suspect with a lengthy criminal record. The squad car crashed as they chased the suspect on the city's northwest side. Milwaukee Police Chief Alfonso Morales said all three men believed in the mission of the police department. "Nobody forces us to do this job," Morales said. "We do this because we believe we can make a difference. We do this because we believe it is the right thing to do." From left to right, Milwaukee Police officers Charles Irvine, Michael Michalski and Matthew Rittner. The three officers who have died in the last eight months. Photo courtesy of WISN 12. Rittner’s former partner, Matt Murray, recalled several stories about the two of them patrolling Milwaukee until 3 a.m. and Rittner’s tenacity and dedication always winning out over sleep. Murray was seven years older than Rittner, leading Rittner to call Murray "grandma" and Murray to refer to Rittner as "son." "He was an incredible friend, a great man and a great partner," Murray said. "Son, you’ll be forever missed." Law enforcement from across Wisconsin attended Rittner's visitation before the funeral service, including the Menominee Police Department, Marinette County Sheriff’s Office, Whitewater Police Department, Sun Prairie Police Department, Beloit Police Department, and Rock County Sheriff’s Office. Dan Cooper has worked with the Kenosha Police Department for 18 years. He didn't know Rittner but wanted to pay his respects. "It’s just a tragedy and sad for all of us," Cooper said. "Especially when you hear he had a young child and wife. It’s always in the back of your mind that something like this can happen, but when it does, it really hits home." Karrie Qureshi was Rittner’s neighbor in Milwaukee for a few years before he and his wife recently purchased a home in the Milwaukee suburb of New Berlin. "Matt was a real stand-up guy," Qureshi said. "He was the kind of neighbor where if he saw someone who needed help, he would do it. One of my good memories was he and his wife, Carolyn, walking their dog and son all of the time in the neighborhood." Sheena Brunette, of Milwaukee, was friends with Rittner. When they were in their 20s, they spent a lot of time together with mutual friends. Like many people who knew him, Brunette said Rittner was always in a good mood. Rittner was a 17-year veteran of the Milwaukee Police Department and served as a member of the Tactical Enforcement Unit for 10 years. He began his career as a police aide in 2001. Rittner was a veteran of the U.S. Marines Corps, serving two tours in the Middle East. In 2016, Rittner was awarded the Public Safety Officer Medal of Valor, the highest decoration for bravery exhibited by public safety officers in the United States. It's comparable to the military's Medal of Honor. On Sunday, Jordan P. Fricke was charged with first-degree intentional homicide. According to the criminal complaint, Fricke fired an AK-47 semi-automatic through an opening in a door and hit Rittner in the upper chest area.